On Monday, the Central Bank of Iraq (CBE) set the terms of non-negotiable banknotes that are repaid after being deposited in the bank. The bank said in a statement that "the banknotes are not valid for trading if it applies one of the descriptions and compensates the holder of their full value immediately submitted to the banksand government and private branches are deposited in the Central Bank and the corresponding amount in their accounts." The bank said that "one of the conditions of banknotes not valid for trading is if the banknotes are smuggled or damaged, although not torn and not lose part of it, in addition to if the paper was damaged as a result of exposure to water," indicating that "the banknote will be invalid in the case of The banknote consists of two parts "different numbers". "The other conditions are that the banknote is affixed to a transparent tape or more along its length or width, or if the banknote was cut in more than one angle or loaned," the bank said, adding that "the other conditions are if it contains seals or Writings do not affect the appearance of the outside, or if the bank lost 50% of its area. The bank noted that "other conditions also if the monetary paper stuck strange materials and affected the features such as inks, dyes, glues, fats and oils, in addition to if the banknote perforated puncture or more and randomly." 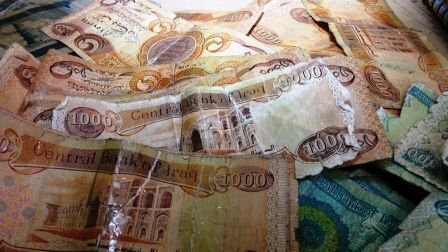 It is noteworthy that the banknotes currently circulating in the local markets have been damaged and ripped without any new notes.